Home » Business » 3 Reasons to Declutter, Once and for All! Spring is a time we usually think about performing a deep cleaning regimen of our home. Open up windows and wash everything down. It’s also a great time to edit our home of belongings that have migrated into our space but are no longer necessary. I hope these 3 reasons to declutter will prompt you to take some steps towards releasing any excess in your living space. 1.) Clutter can cost you time. Think of the time spent looking for misplaced items, prepping meals in a disorganized kitchen, packing or getting dressed when we are faced with an overstuffed closet. We all have 24 hours in our day and can’t afford to waste a minute. 2.) Clutter can cost you money. Misplaced bills can incur late fees. A disorganized work space can be cause for a missed advancement opportunity. Buying duplicate items you already own but cannot find. Are you renting a storage unit for your excess belongings? This all equates to lost money. 3.) Clutter can cost you your health. Various studies indicate clutter can increase stress, anxiety, affect your ability to focus and make us tired. 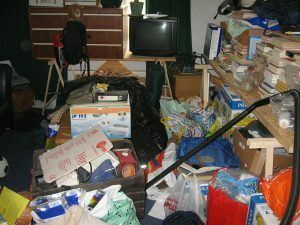 Excess clutter fosters an environment that is difficult to keep clean which can enhance illness or allergy issues. Yes, your clutter can make you sick! Are you ready to declutter? 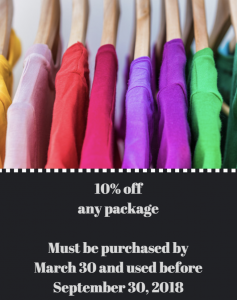 Take advantage of our spring coupon! If you’re ready to take some steps to release the burden of excess in your home or work space, we are here to help. Take advantage of our spring coupon and give us a call, (412)-841-6724. Here’s how the spring special coupon works: Commit to any package size (4, 12 or 20 hours) by March 30 and use your package hours before September 30. The coupon is good for ONE package only.